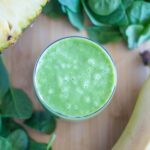 I am sharing with you a totally healthy and tasty Pineapple + Banana Green Smoothie which is inspired by Simple Green Smoothies. I was very fortunate to hear Jadah from Simple Green Smoothies speak not once, but twice over the weekend at the Problogger Training Event. Jadah is one inspiring lady and with her friend Jen, they founded Simple Green Smoothies, which is a bit of an internet sensation. If you have not heard of or checked out Simple Green Smoothies, then you need to go and do that right now (well after you finish checking out my latest recipe of course). This smoothie is super delicious and is a great way to start your day or will make an super healthy snack. If you are able to freeze some of fruit before hand, you won’t need to add any ice to the recipe. But otherwise the ice does not detract from the awesome flavour.